Located on the Ninh Kieu banks of the Hau river- one of the nine estuaries of the Mekong Delta- Golf Can Tho is a splendid modern style hotel set in the magnificent Can Tho city. 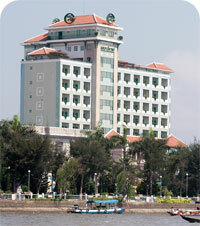 The hotel feature 101 rooms, 8 of which are spacious suites, all has balcony with a half river view. Golf Can Tho provides guests with extensive international services and facilities benifitting one of Vietnam’s officially accredited four- star hotels. Opening on 2002 and received certificate of Vietnam National Administration of Tourism. IDD (International Direct Dial) telephone. This restaurant serves Asian and Western cuisine, including buffets, a la carte, set menu lunch and dinner, specialities. Traditional food in Southern of Vietnam. The Golf Lounge is ideal for rendezvous, reading newspapers, having a chat ..., offering a wide selection of drinks & fruit juices. A favorite venue for chatting with traditional music band and views of the Ninh Kieu Quay. A unique place in town to dine or drink in the open air superlative views of the Hau River. Serving Vietnamese Cuisine,Buffet Breakfast, A la Carte, Drinks, Cocktails,Fruit Juices, Ice-Creams & Snacks. You must love this place and its breathtaking panoramic views of the Hau River and unlimited views of the street.